David My name is David Materazzi. I am from Wilkes-Barre, Pennsylvania. I lived here all my life. I met my wife about 16 1/2 years thru A.O.L. online chat room. I found out she lived only a few miles away from me over the river. Asked her out on a date and been with her ever since. We have a son who is 12 years old. We got married in June 2002. I've been working for a Hunting and Fishing Wholesale Sporting Goods for the last 20 years. I love doing home improvements to our house when I get the time. Love to go the movies each weekend with my wife. We like to call it a date together. David I started back in March, 2009.I found out about Zazzle thru a friend that saw a bumper sticker on someone's truck. He told him where he bought it from so I ordered a few for him. The next thing I knew, I was reading about how to make money with designing and products. People tell me that I can be creative when I put things together. So I gave Zazzle a try and I love it. 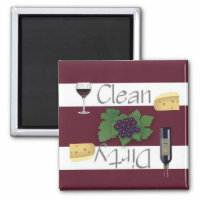 David My best selling product is my Clean or Dirty Wine Dishwasher Magnet. David I enjoy doing home improvements, watching movies and tv. I love surfing the internet and the forums to see what I can learn. David It's not that hard. I work all day from 8:30am to 5:00pm. I only work a few minutes (about 2 miles away) from home. I get home and check my email for any sales. I eat supper and after that if I have any designs I want to add, I just work on them until 8:00pm. After that I watch tv or a movie and rest. If nothing is on and I'm bored, I come back up on the computer and maybe add a few more designs on. It's really a business for me to make extra cash and have fun doing something I like to do. I am hoping that I can really make something of this someday and work from home in the future. David I just got my Proseller Status recently like most did on the last upgrade. David Don't give up. Keep desiging what you can do. Read the forums and learn from others. Designing is one thing but advertising is another, Get your name out there for others to see. You can have 3,000 products in your store and get no sales.Think of ways to tell people you exist. If you don't know the answer, don't be afraid to ask someone. There are so many helpful Zazzlers on here that will give you advice and answers. The most important thing is patience. Your time will come. Good luck and keep Zazzling. Very glad to see you fill out an interview, David! People are right to tell you that you are creative, because it's true. You have a lot of really awesome things in your shop.